If you want to add additional metadata to your content, beyond the default Personalization Engine meta tags, you can specify additional meta tags for Sailthru to spider. This data is stored as ‘content vars’ and is included in your content feeds for use in templates. Content vars can also be used as criteria for building/filtering a Personalization Engine content feed. Identify the meta tags on your content pages that you want Sailthru to spider. Personalization Engine meta tags are included by default.For example, in addition to the green Personalization Engine meta tags and default title tag, you could tell Sailthru to spider the orange tags. On the Spider Preferences page, enter the meta tag names that you want Sailthru to spider. For example: When a page is spidered, all additional tags specified in the field above will be collected. 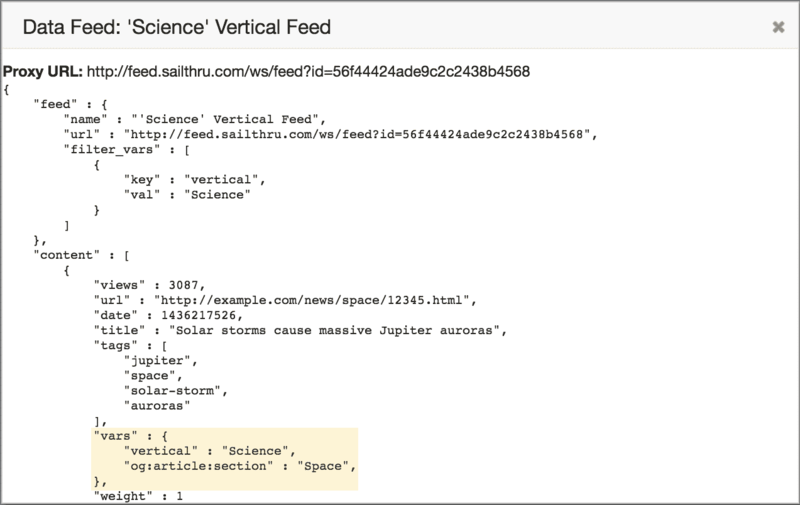 These tags will be made available as content vars in your data feeds and can be used to filter content when specifying the criteria for a Personalization Engine content feed. For example, you could create a content feed containing only those items which have a vertical value of “science”. For meta names that contained a period, the period will be converted to an underscore in the var name.E.g. <meta name="st.foo"> will become st_foo in the data feed. For meta tags that contain multiple consecutive dashes, they will be stripped to a single dash.E.g. this---tag becomes this-tag. Meta names that contain a colon, such as og: tags, will be stored as written. You can also use these vars when creating a Content Feed, where you can choose to include or exclude items matching particular var values.